Take a peek at Michigan history. Discover an overview of Michigan's rich history, heritage, historic events, and culture. Following the prehistoric inhabitants, Michigan's residents were the tribal groups of Ojibwa, Ottawa and Potawatomi Native Americans. The first Europeans were the French and French- Canadians. ?ienne Brul? of France, arrived in 1618 and named the region New France. In 1634, Jean Nicolet explored parts of the Upper Peninsula for France. Missionaries arrived and established a mission at Keweenaw Way in 1660. In 1668, Father Jacques Marquette established the first permanent settlement of Michigan at Sault Sainte Marie. France was ousted from the territory by Great Britain in 1763, following the French and Indian Wars., and England controlled most French claims in North America, including Michigan. Chief Pontiac led the Ottawa Indians in attacking a number of forts this same year, killing many of the settlers. During the Revolutionary War, settlers in Michigan favored British rule and often raided American settlements. At the end of the war in 1783, Michigan came under American control. Detroit and Fort Mackinac however, did not surrender until 1796. In 1787, Michigan became part of the Northwest Territory. In 1805, the Lower Peninsula and the eastern part of the Upper Peninsula became the Territory of Michigan. After the Revolutionary War, the US acquired most of the region, which remained the scene of constant conflict between the British and US forces and their respective Indian allies through the War of 1812. The policy of pushing Native Americans westward and opening the lands for settlement was largely due to the efforts of Gen. Lewis Cass, who was governor of Michigan Territory (1813-31) and later a US Senator. Steamboat navigation on the Great Lakes and sale of public lands in Detroit both began in 1818, and the Erie Canal was opened in 1825. After statehood, Michigan promptly adopted a program of internal improvement through the building of railroads, roads, and canals, including the Soo Locks Ship Canal at Sault Ste. Marie in 1855. By 1870, lumbering in the northern forests led the nation in lumber production. No battles were fought on Michigan land during the Civil War (1861-1865), but by then over 90,000 Michigan men, and at least one woman disguised as a man, will have served in the Union armies; approximately 15,000 will have died. The Fourth Michigan Calvary under General Custer captured Jefferson Davis, president of the Confederacy on May 10, 1865. Ransom E. Olds of Lansing who starts Michigan's first auto company in 1900. Like King and Ford, Olds develops a gasoline-powered engine. In 1900, after setbacks, Olds opens the nation's first factory designed specifically for auto production. The following year he begins producing the Curved-dash Runabout, which has a one-cylinder engine and is lightweight and inexpensive. Other plants were built in Lansing and Flint. Detroit soon became known as the Automobile Capital of the World. The Great Depression (1929-1939) caused hundreds of thousands of people to lose their jobs. One of President Franklin D. Roosevelt's most popular New Deal relief programs, the CCC is a massive conservation program that employs tens of thousands of young men all across the nation. Two hundred young men from Detroit arrive at an isolated spot in Chippewa County and set up Camp Raco--Michigan's first Civilian Conservation Corps (CCC) facility. Within months, dozens of similar camps open across northern Michigan. During both World Wars, the entire automobile industry switched to manufacturing tanks, jeeps, airplanes, and other needed war materials. This production helped to end the Great Depression. In 1955, a new copper mine opened in Ontonagon. Shipping was facilitated in 1957 with the completion of the Mackinac Bridge, connecting the Upper and Lower Peninsulas. Racial problems escalated in 1967. Forty-three people were killed and over $45 million worth of property ruined, in an eight-day riot in Detroit. New taxes were adopted to bring increase revenue for education, welfare, and other government services. In 1972, a state lottery was also established to help raise money for these purposes. The 1970s brought another recession nationwide to the economy. With an increase in international markets, the automobile industry slumped. By 1980, Michigan had the highest unemployment rate in the nation. Gratefully, automotive sales increased in 1984 that reduced the state unemployment. 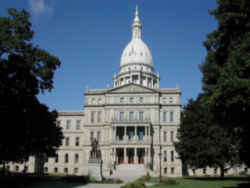 Today Michigan leaders are looking for ways to attract new industries to the state. Tourism has increased and some computer-related businesses are moving into the state. Michigan has a rich past. These 16 important dates chronicle over 300 years of Michigan history by featuring the people, places and events that make them significant. MAY 17, 1673. Jesuit missionary Jacques Marquette, fur trader Louis Jolliet and five voyageurs leave the recently established Indian mission at St. Ignace to explore a great river known by the Indians as the "Messissipi." The French have been exploring the Great Lakes since Etienne Brul?reached the St. Marys River around 1620. In two canoes, Marquette's party travels along the northern shore of Lake Michigan, enters Green Bay and crosses present-day Wisconsin. The explorers paddle down the Mississippi, but by mid-July they realize that the river is not the long-sought passageway across North America to China. Though Marquette will die in 1675, the French will continue to explore the Great Lakes, ship furs to Europe and Christianize the Indians. In 1679, Robert Cavelier Sieur de la Salle will direct the construction of the Griffin--the first sailing vessel on the upper Great Lakes. That same year, La Salle will build Fort Miami at present-day St. Joseph--the first non-Indian community in the Lower Peninsula. JULY 24, 1701. Antoine de la Mothe Cadillac, a forty-three-year-old French army officer, selects a site at le d?roit (the straits)--the waterway between Lakes St. Clair and Erie--and establishes a French settlement. Cadillac has convinced King Louis XIV's chief minister, Count Pontchartrain, that a permanent community at present-day Detroit will strengthen French control over the upper Great Lakes and repel British advances. The one hundred soldiers and workers that accompany Cadillac build a 200-square-foot palisade and name it Fort Pontchartrain. Cadillac's wife, Marie Th? ?e, soon moves to Detroit, becoming one of the first white women to settle in the Michigan wilderness. At the same time, the French strengthen Fort Michilimackinac at the Straits of Mackinac in order to better control their lucrative fur-trading empire. By the mid-eighteenth century, the French will also occupy forts at present-day Niles and Sault Ste. Marie. However, they will lose their North American empire when the British defeat them in the French and Indian War (1754-1763). By 1760 the Union Jack will fly over the Great Lakes. JULY 11, 1796. US regulars under the command of Lt. Colonel John F. Hamtramck enter Detroit and replace the British Union Jack with the Stars and Stripes. The ceremony comes thirteen years after the signing of the Treaty of Paris at the end of the American Revolution. The delay has been caused by British reluctance to abandon their center of trade and power in the Ohio River Valley. As recently as 1791 the British included Michigan in their governmental reorganization of Canada. The following year, Michigan residents voted in their first election and elected three Detroiters to Ontario's provincial assembly. 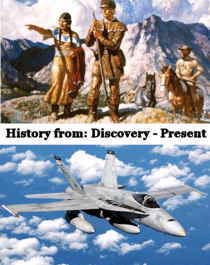 To thwart United States development of the Great Lakes area, the British have been supplying the Indians with arms. Two US military efforts to subdue the Indians ended in disaster before General "Mad" Anthony Wayne defeated the Indians at the Battle of Fallen Timbers on August 20, 1794, near present-day Toledo, Ohio. Wayne's success prompted the British to evacuate the northwestern forts, opening the way for Hamtramck's troops. In 1805 the Michigan Territory will be organized. JANUARY 22, 1813. A British force of 1,300 soldiers and Indians falls upon an American army at the River Raisin near present-day Monroe. Against direct orders, US Brigadier General James Winchester has moved his force of 700 Kentuckians and 200 regulars to the River Raisin. There they are encamped in a poor defensive position. Their leaders have not investigated reports of an imminent British attack. The Americans repulse several British assaults, but finally they surrender because Winchester fears a possible Indian massacre. The British withdraw after the battle leaving behind eighty wounded Americans. The following day, the Indians murder many of these soldiers. The Battle of the River Raisin--the largest battle ever fought on Michigan soil--concludes a series of US setbacks in Michigan during the early months of the War of 1812. Earlier, in mid-1812, Michigan Territorial Governor William Hull, who commanded US forces in Michigan, had invaded Canada prematurely, then retreated and surrendered Detroit after only token resistance. About the same time, the US garrison at Fort Mackinac was taken by surprise and surrendered without firing a shot. In September 1813, US forces will return to Michigan and, amidst cries of "Remember the River Raisin," they will drive the British from Michigan soil. Michigan will grow slowly after the war, but the opening of the Erie Canal in 1825 will precipitate a flood of immigrants, especially from New York and New England. JANUARY 27, 1847. Francis Troutman and several others arrive at the home of the Adam Crosswhite family--Kentucky slaves who have escaped to Marshall. Troutman, who plans to return the Crosswhites to their former master, is confronted by several hundred Marshall residents who threaten the slave holders with tar and feathers. While Troutman is being charged with assault and fined $100, the Crosswhites flee to Canada. Since 1832, Michigan has had an active antislavery society. Quakers in Cass County, Laura Haviland in Adrian and former slave Sojourner Truth in Battle Creek are only a few of the many Michiganians working on the Underground Railroad--an informal network that assists escaping slaves. Southern concern over the Underground Railroad will lead Congress to pass a more stringent Fugitive Slave Law in 1850. In 1854 opposition to the extension of slavery will prompt Michiganians to meet in Jackson and organize the Republican party. The following year Michigan's first Republican-controlled state legislature will adopt personal liberty laws, which prohibit state and local officials from cooperating with federal marshals in recovering escaped slaves. JUNE 22, 1855. The passage of the steamer Illinois through the locks at Sault Ste. Marie marks the opening of unobstructed shipping between Lakes Superior and Huron. Ships are no longer forced to stop at Sault Ste. Marie and portage their cargoes around the rapids of the St. Mary's River, which drops twelve feet from Lake Superior to Lake Huron. The canal is the result of a long-sought 1852 grant by Congress to Michigan of 750,000 acres of public land. Construction, begun in mid-1853, has progressed despite cost overruns, food shortages, a hostile climate and a cholera epidemic. The mile-long canal and two 350-foot locks arranged in tandem have been completed in two years. The Sault locks provide new impetus to Michigan's fledgling mining industry. Copper mining on the Keweenaw Peninsula began in the early 1840s, and Michigan led the nation in copper production for many years. In 1844 surveyor William A. Burt discovered iron ore deposits near Negaunee. Iron ore mining expanded gradually, but by the late nineteenth century Michigan produced more iron ore than any other state. Michigan also produced significant amounts of salt, gypsum, oil and natural gas. JANUARY 28, 1877. Winfield Scott Gerrish opens the 7.1-mile-long Lake George and Muskegon River Railroad in Clare County. Following a warm winter that seriously hampered logging activities, Gerrish moves 20 million board feet of logs to the Muskegon River. The next year he increases his output sixfold. Though Gerrish is not the first to build a Michigan logging railroad, his operation is well-publicized and successful. It revolutionizes lumbering in Michigan. By 1882, thirty-two narrow-gauge logging railroads will operate in the state. The railroads permit new areas to be logged, all sizes of trees to be cut and, most importantly, allow year-round transportation of logs to the sawmills. Commercial logging in Michigan has flourished since the Civil War, drawing immigrants from around the world--especially Scandinavians, Germans, Irish and Canadians. Michigan will retain its national leadership in lumber production until 1900. By the end of the lumbering era, Michigan loggers will have cut 161 billion board feet of pine logs and 50 billion board feet of hardwoods. That is equivalent to a half-mile wide, one-inch plank road from New York to San Francisco. In dollar value, Michigan lumber will outvalue all the gold extracted from California by a billion dollars. It will also create a furniture industry centered in Grand Rapids that flourishes well into the twentieth century. However, wasteful logging practices will leave enormous cutover acres that are periodically ravaged by fire. In 1881--in one of Michigan's worst natural disasters--fires in the Thumb will leave 300 people dead. This fire also will be the first disaster relief project for the American Red Cross. MAY 2, 1933. Two hundred young men from Detroit arrive at an isolated spot in Chippewa County and set up Camp Raco--Michigan's first Civilian Conservation Corps (CCC) facility. Within months, dozens of similar camps open across northern Michigan. One of President Franklin D. Roosevelt's most popular New Deal relief programs, the CCC is a massive conservation program that employs tens of thousands of young men all across the nation. The CCC revitalizes Michigan's state park system, establishes Isle Royale National Park and builds campgrounds in Michigan's national forests. All will benefit the state as tourism becomes one of its main economic resources. Michigan enrollees also send home $20 million of their monthly salaries and acquire invaluable training that will make their transition to military service in World War II easier. When the program ends in 1942, over 100,000 Michigan men will have served in the CCC. Their accomplishments will include: planting over 484 million seedlings (more than twice the number in any other state), expending 140,000 man-days in fighting forest fires, placing 150 million fish in rivers and lakes, and constructing 7,000 miles of truck trails, 504 buildings and 222 bridges. DECEMBER 30, 1936. Spurred by an unfounded rumor that work is going to be transferred to plants with weak union support, autoworkers begin a spontaneous sit-down strike at General Motors Corporation (GMC) plants in Flint. When the workers reject a court injunction demanding that they leave the factories, the National Guard is mobilized to keep the peace. As the strike drags on, the workers' wives organize to show support for their husbands' cause and keep them supplied with provisions. The strike is a reaction to worsening unemployment and working conditions in the early 1930s, as well as a result of autoworkers' increased interest in union representation. In the past, semi- or unskilled autoworkers had been unwelcome in craft unions. Since 1935 the newly formed United Automobile Workers of America (UAW), armed with the Wagner Act that guarantees workers the right to organize and bargain collectively, has been confronting GMC--the nation's largest auto manufacturer. Despite charges of low wages and degrading working conditions, GMC has refused to recognize a single union as the worker's sole representative. The Flint sit-down strike ends in early February when GMC agrees to recognition and other demands. Other auto manufacturers soon recognize the UAW, but the Ford Motor Company will hold out until May 1941. Nevertheless, the Flint sit-down strike makes Michigan one of the nation's most powerful union states. OCTOBER 1, 1942. The first B-24 bomber rolls off the assembly line at the Willow Run Bomber Plant near Ypsilanti. In December 1940 the federal government asked the Ford Motor Company to build 1,200 B-24 bombers. Ford's chief engineer, Charles Sorensen, quickly devised a yet-untried scheme of mass-producing planes. The government agreed to the plan, and in April 1941 construction began on what will become the world's largest assembly plant. The plant will produce 8,600 planes. By early 1944 bombers will come off Willow Run's mile-long assembly line at the rate of one an hour. Michigan's other auto companies are also producing war materiel. By the end of World War II, Chrysler's Warren Tank Plant will have made 25,000 tanks, while in Kingsford, the Ford Motor Company will have manufactured over 4,000 gliders. Known as the "Arsenal of Democracy," Michigan--with only four percent of the nation's population--will lead all other states in the production of war materiel. NOVEMBER 1, 1957. The Mackinac Bridge, connecting Michigan's two peninsulas, opens. After numerous proposals to bridge the Straits of Mackinac--the earliest in 1884--Governor G. Mennen Williams appointed the Mackinac Bridge Authority in 1950. Former US Senator Prentiss M. Brown of St. Ignace served as chairman. After much effort, the authority received legislative permission to build the bridge. The project began in May 1954. The bridge's central span--3,800 feet between the towers--is the third largest such span in the world. The length between anchorages is 8,614 feet, making it the world's longest suspension bridge at this time. By 1989, two million vehicles annually will cross the bridge, and every Labor Day thousands of people will walk across the 26,444-foot-long structure. "Michigan Through the Years" was originally published by Michigan History magazine in 1989. It is no longer available in print.